"Banana Bunch" redirects here. For information about the minigame in Mario Tennis for the Game Boy Color, see Banana Bunch (minigame). "Banana Peel" redirects here. For information about Diddy Kong's special move in the Super Smash Bros. series, see Banana Peel (move). "Bananas" redirects here. For information about the microgame in the Gamer minigame in Game & Wario, see Bananas (microgame). Bananas are common tropical fruit from the Mario, Yoshi, and Donkey Kong franchises. They are based on the fruit of the same name, specifically, the cavendish banana. Bananas are widely used as food due to their restorative properties and Banana Peels are also used as an offensive weapon in competitions such as the Mario Kart series. 1.2.2 Mario Kart: Double Dash!! A banana bunch lying under a vine is among the fruit Donkey Kong Jr. can drop on enemies in Stage 1 of his debut game. Like every other fruit in the game, this banana bunch awards the player 400 points if touched. Bananas are the ubiquitious items appearing in every Donkey Kong Country and Donkey Kong Land to date. They work similarly to the Coins from the Mario franchise. In these games, for every one hundred bananas collected, the player is granted an extra life. Banana Bunches, which are worth ten regular bananas, appear very frequently as well. 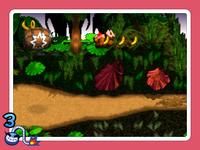 In Donkey Kong Country, bananas and Banana Bunches are common within Bonus Areas, even having a type specifically featuring them, "Collect the Bananas!". Throughout the game, Donkey Kong can sometimes reveal a Banana Bunch by using Hand Slap in a specific location. In Donkey Kong Country 2: Diddy's Kong Quest, some groups of bananas are in the shape of an arrow, pointing at a wall. Brekaing the wall reveals the entrance to a Bonus Area. Sometimes a single, standalone banana in an higher area represents the location of either a hidden object (such as a Barrel Cannon or a hook), a hidden item (such as an Extra Life Balloon), or even a Bonus Barrel. This also occurs in the sequel, Donkey Kong Country 3: Dixie Kong's Double Trouble! In both games, some bananas are arranged in the shape of a controller button, indicating the button that the player must press in that moment. One such example is in the Donkey Kong Country 3 level, Bobbing Barrel Brawl, where a group of bananas shaped as a "Y" tell the player to press for Ellie to draw over a TNT Barrel stuck between two red Buzzes. In the Game Boy Advance port, the arrangement of these bananas were updated to match with the appropriate Game Boy Advance button. Bananas appear in Donkey Kong Country Returns and Donkey Kong Country Returns 3D, reprising their role from the earlier Donkey Kong Country games. In these games, Banana Bunches are worth five regular bananas instead of ten. However, there is also a bigger type of bunch that is fairly rare and worth ten bananas. Additionally, there are winged bananas that float around in certain areas (mostly Bonus Areas), which are worth five bananas. In the Golden Temple, there are enormous, floating bananas (amongst other fruit) that serve as platforms for Donkey and Diddy Kong. In Donkey Kong Country: Tropical Freeze, collecting one hundred bananas will enable the Kongs to perform a Kong POW, aside from receiving an extra life. Flying Bananas are followed by trails of regular bananas and will turn into an important item, such as a Banana Coin or a Puzzle Piece, when all bananas behind it are collected. In Donkey Kong 64, bananas are featured in five different colors. Each color can only be collected by a certain Kong: yellow for Donkey Kong, red for Diddy Kong, purple for Tiny Kong, blue for Lanky Kong, and green for Chunky Kong. There are exactly 500 bananas (100 per color) in each of the game's seven levels, for a total of 3,500 bananas in the entire game. The bananas are required collectable items, as the Kongs must feed them to Scoff, who slowly grows larger for each banana that he eats. Eventually, Scoff becomes large enough to stomp his platform, allowing Troff to reach the key in the boss door. Unlike the Donkey Kong Country trilogy, Banana Bunches are worth five bananas. A Banana Balloon is worth ten bananas, which the Kong can obtain by sniping their associated Banana Balloon. Aside from this, Bananas, or rather, their peels, played an important role in the final battle against K. Rool, more specifically when fighting him as Lanky Kong. Due to K. Rool being blinded due a light fixture falling on him, Lanky used barrels containing giant banana peels to place one on the ring, and then deliberately play music to K. Rool to lure him over to the banana peel so he'd slip on it. In Mario vs. Donkey Kong, banana bunches reprise their original role from Donkey Kong Jr. as fruit that can be dropped on enemies to attack them. This time, they do not award the player any points if touched, but will award 500 points if they hit an enemy. They are present in Levels 2-5, 2-DK, 2-2+, 2-5+, and 2-DK+. "Beat" redirects here. For information about the Mega Man character and one of Mega Man's custom special moves in Super Smash Bros. for Nintendo 3DS and Super Smash Bros. for Wii U, see Mega Man § Rush Coil. Normal bananas and banana bunches also appear in Donkey Kong Jungle Beat, this time called Beats. In this game, Donkey Kong's banana total acts as his overall health (in the New Play Control! version, they only act as his health for boss battles); losing all of his beats results in a Game Over. Normal bananas are worth one Beat, and bunches are worth three, but stringing together multiple combos and clap grabbing multiple bananas increases the amount of Beats they are worth. Additionally, giant banana bunches also appear at the ends of the levels in the Banana Kingdom and the level Banana Banquet. Biting these, as well as the other giant fruits, causes juice to gush out and the level to end. Lastly, there is a minigame after said levels involving Donkey Kong eating as many bananas as he can in the allotted period of time, to increase his Beat total for that level. In DK: King of Swing, up to 300 bananas can be collected. Donkey Kong can then use the bananas to heal his health or become invincible. The Banana (also known as the Banana Peel) is one of the most common items in the Mario Kart series and has appeared in every game of the series. A Banana Peel causes a kart to spin-out if the vehicle touches the slippery item, slowing them down a bit. Banana Peels can either be placed behind a kart, or be thrown forward down the track. It can also be held behind the kart as a defensive countermeasure against homing Red Shells and, to a lesser extent, Green Shells. Bananas can also come in threes, known as Triple Bananas. When used, three bananas automatically attach themselves to the back of the kart. Like many other items in the Mario franchise, the Banana has eyes. The Banana also appears as the emblem of the Banana Cup. In Mario Kart 64, along with single bananas, bananas appear in fives instead of threes, and are known as Banana Bunches. Banana Bunches function the same as Bananas, except that when a racer runs into the center of the Banana Bunch line when another player is carrying it, a sound effect will play and the player will get considerably slowed down. The icon for Banana Bunches displays only four bananas as opposed to five. In addition, only one of the bananas features eyes. A Giant Banana from Mario Kart: Double Dash!! Bananas return in Mario Kart: Double Dash!!. There is also a larger variant exclusive in the game called the Giant Banana, which only Donkey Kong and Diddy Kong can use. Triple Bananas return in Mario Kart 8 and Mario Kart 8 Deluxe, however, rather than following behind the Kart, Bike or ATV they orbit it, similarly to Triple Green or Red Shells. A single banana appears the adverts for BaNaNa Boy. In the Club Nintendo comic "Super Mario Klemp-Won-Do: Muskeln sind nicht alles! ", Mario used some Bananas to make his opponent Blanka slip and fall. Being the Kongs' favorite food, Bananas serve as the main victuals in the comic "Donkey Kong in: Banana Day 24" when Donkey and his friends travel to Outer Space in order to stop aliens from pulling Earth away from the sun. As it turns out, the culprits just erroneously took the planet for a huge coconut, a fruit their species adores. Diddy suggests to give Bananas to the extraterrestrials as a compensation to get Earth back. This plan works, and the aliens are enthusiastic about the Bananas' taste. Their use as weapons in the Mario Kart series was referenced in the comic "Die Jagd nach dem Nintendo 64: Krawall im All," when Mario and Luigi dropped some Banana Peels in front of Wario and Bowser, as they were competing to find a Nintendo 64-like spaceship. Bananas are the favorite fruit of Yellow Yoshis in Yoshi's Story, along with the universally loved Melons. Banana bunches also appear in Yoshi Touch & Go. If a Yoshi eats one, it will get three more eggs. Bananas appear in WarioWare: D.I.Y. Showcase, in which a microgame called DK Country has Diddy Kong getting shot out of a Bonus Barrel and collect six bananas, whilst avoiding a Zinger. In WarioWare Gold, Bananas appear as obstacles in the Super Mario Kart microgame, where the player must stay on Rainbow Road. They also appear in the Donkey Kong Country microgame, where Donkey Kong must be fired from a Barrel Cannon into a row of bananas. Bananas in Mass A-peel, a minigame from Mario Party 5. The Banana is a popular item that shows up in many minigames in the Mario Party series. They are mainly featured in Donkey Kong minigames, where bananas are worth one, two, or three coins depending on a random multiplayer. The banana also appears in many Mic Minigames. In Mario Party 5 and the other Mario Party games after, there is a kind of banana called Banana Bunches. Banana Bunches are worth five bananas. They are mainly found in Donkey Kong minigames. 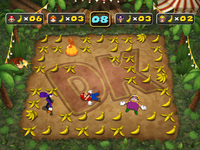 In Mario Party 9, Bananas replace Mini Stars in the unlockable board DK's Jungle Ruins. On this board, the players' goal is to collect the most Bananas. They can be won on this board in all the same ways that Mini Stars can be won on other boards. Z-Bananas also appear on this board as a counterpart to Mini Ztars. In Mario Party 10, several banana bunches are carried by a moving Mine Cart in the background of the Donkey Kong Board. Bananas appear in Mario Party: Star Rush as obstacles in Bowser's Shocking Slipup, where they appear as one of only two items on the roulettes. They stun the player for a few seconds if touched. In Luigi's Mansion, Garbage Can Ghosts will throw Banana Peels on the floor. Luigi can slip on these peels, damaging the plumber with 5 HP taken away (10 HP in the Hidden Mansion). They can also be found lying on the ground in the Dining Room, where Mr. Luggs resides. 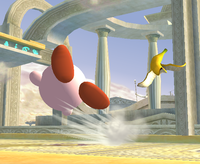 Bananas are one of many food items in the Super Smash Bros. series. In Super Smash Bros. Melee and Super Smash Bros. Brawl, they restore 5% damage; in Super Smash Bros. for Nintendo 3DS, however, bananas restore only 3% damage, and only appear in Tortimer Island stage. The Banana Peel also appears as an item in Super Smash Bros. Brawl, Super Smash Bros. for Nintendo 3DS / Wii U, and Super Smash Bros. Ultimate. Once thrown, anyone who walks over it will trip and fall onto their back. It is also used in Diddy Kong's down special move. In Super Smash Bros. Ultimate, an offensive item known as a Banana Gun also appears. Bananas grow throughout the Isle Delfino and are sold in Delfino Plaza's market sector by a street vendor. A local woman took enough interest in them to request Mario's help in gathering them. In Ricco Harbor, a supply of Bananas and other fruit are stored in a gigantic tank used in the episode "Yoshi's Fruit Adventure". Hotel Delfino in Sirena Beach sell the fruit at fruit bars as well. The Yoshis on the island turn into Pink Yoshis after eating them. They also fall faster and have more friction than other fruits. 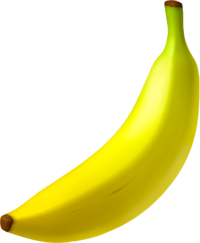 In Mario Power Tennis, in the mode where players can hit the balls through Item Boxes, the Banana tends to appear, known as "Slippery Danger" within the game. The player has to hit the ball with the racquet in order to use the item. When used, the banana will be attached with the ball until it stays still on the ground in the case the ball bounces. Also,the Garbage Can Ghost in the Luigi's Mansion stage throws bananas that have the same function as the regular bananas as a stage gimmick. In Mario Tennis Open, plenty of Bananas are seen on the DK Jungle court. 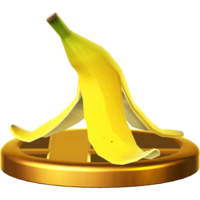 The Banana is the emblem for the Banana Cup and appears on its trophy. Tennis gear for Miis are designed based on this item. In Mario Golf: World Tour, bananas are seen in food bowls on some tables of the Castle Club's Royal Room, as well as inside barrels, which are the tee markers of the DK Jungle course. Golf gear is designed based on this item and available for use by Miis. In Diddy Kong's Bogey animation, he eats a banana while lying down and throws it on the ground. He does the same when he gets a Double Bogey or worse, but then he tries to get up and walk, only to slip on the banana. 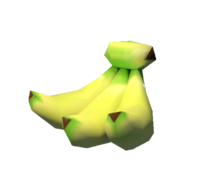 In the Mario Strikers games, the Banana acts as an item that players can collect. Once used, the player will drop three or five banana peels behind them, which will proceed to knock over any player who runs into them. This includes both the opponent, and the user. If used near an edge, only a few banana's will stay on the field, as the other banana's will fall off the stadium. A similar item is the Giant Banana. During Diddy Kong's ground entrance, he pulls out a Banana, and whacks it on his hand, which is used to say that he is going to crush his opponent. Banana Peels reappear in Mario Sports Mix. They can either stop opponents for a short time, or power up the ball or puck. When used as an item shot, the ball will make a curved path, a reference to the face that bananas themselves are curved, and can cause opposing players to slip if they touch it. In Western Junction, a train with cars full of Banana Peels may drive through the court, and Shy Guys on board the train will throw Banana Peels on the court so any player may slip over them. In the Nintendo Land attraction Donkey Kong's Crash Course, the objective is to collect bananas and reach Donkey Kong and Pauline. In Super Mario Maker, an unpeeled banana appears in the Diddy Kong costume's pose when the player presses . Bananas reappear as currency exclusively in the Donkey Kong Adventure mode of Mario + Rabbids Kingdom Battle, replacing coins from the main game. SNES Super Mario Kart The peel from a Japanese fiber banana of the Musaceae plant family. It contains a high volume of vegetable oil, which oozes out when the peel is stepped on, making things slippery. In Smash Bros., the peel fulfills its destiny as a comedic prop by making passersby slip. Characters who land on their backsides will be defenseless until they recover their footing. Wii Mario Kart Wii (4/2008) Looks like someone had a nice snack and didn't bother to clean up afterward... As you may suspect, stepping on a banana peel sends you falling to the ground and exposes you to attacks. You can throw these at your opponents too, but please clean up when you're done, all right? HEY! Put that banana peel in the bin! ...Oh, you're going to trip up your opponent with it? Carry on, then. Of course, picking up and throwing banana peels at people is disgusting, but they'll have a hard time keeping their defences up if they're putting on a one-man slapstick act, so...go ahead. Trading Card Description: "A delicious fruit and a great source of potassium, the single Banana is, simply, good for you. But this is Mario Kart Wii we're talking about and there are no edible bananas here...only the slippery Banana peel that you and your racing rivals can toss out on the track. If your Kart or Bike touches a Banana you won't peel out, you'll spin out. That, of course, leads to longer lap times." Game Tip! : "When tossing a Banana out in front of your vehicle, be aware of where it lands. You don't want to be the recipient of your own nefarious tactics." A Banana Peel, from Mario Kart: Double Dash!! This page was last edited on April 19, 2019, at 07:37.